Home » books , darth plagueis , james luceno , reviews , star wars » Review of STAR WARS: DARTH PLAGUEIS: Luceno's latest well worth seven year wait! Review of STAR WARS: DARTH PLAGUEIS: Luceno's latest well worth seven year wait! "Did you ever hear the Tragedy of Darth Plagueis the Wise? It's a Sith legend. Darth Plagueis was a Dark Lord of the Sith, so powerful and so wise that he could use the Force to influence the midi-chlorians to create life. He had such a knowledge of the dark side that he could even stop the ones he cared about from dying." If you are a fan of Star Wars to whatsoever degree at all, leave your chair right now and IMMEDIATELY go to your nearest bookstore and buy a copy of James Luceno's Star Wars: Darth Plagueis. Or go to Amazon.com and order a copy from there. However the heck you must, well... you must! Because Star Wars: Darth Plagueis wildly exceeded my ridiculously high expectations for this novel: a tome that many of us have been waiting nigh on seven years for! There are two massive reasons why I've been stoked about Darth Plagueis. That it's about the eponymous Dark Lord of the Sith who - if you read between the lines - you already know was the mentor of Darth Sidious, AKA Palpatine: the future Emperor and master of Darth Vader. All we've solidly understood about Plagueis until now is from that "ghost story" which Palpatine shares with Anakin in Revenge of the Sith: how Plagueis discovered a path to physical immortality. It becomes the most tantalizing lure that soon brings Anakin to embrace the dark side. But between that and how eventually he was murdered by his disciple, Darth Plagueis has been a massively black question mark: one that legions of fans of the saga have wanted to be addressed for most of the past decade. The other big reason why I've been looking forward to Star Wars: Darth Plagueis is that it's author is James Luceno: easily among the top tier of Star Wars writers today. And this is a novel that he's been on record as wanting to write since 2005, just before Revenge of the Sith came out. 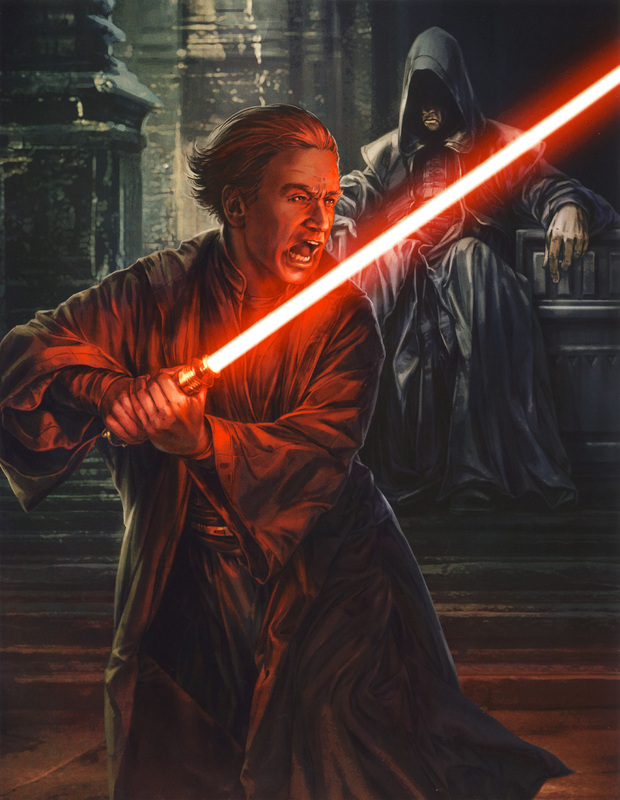 At the time Luceno wanted to pen a tale about how Darth Plagueis and Qui-Gon Jinn in their own unique ways pursued immortality, but how Jinn found the "right" path to it. And for a time it looked like we were going to get that book, along with the backstory of Darth Plagueis. Then about five years ago the word came down from on high at Lucasfilm that Luceno's Darth Plagueis book had been cancelled. The official rationale given was that it was "decided that this was not the right time to delve into Palpatine's back story and Plagueis's beginnings..." I figured that Plagueis and Palpatine was a subject that was going to forever be a gray area ripe for fan speculation. 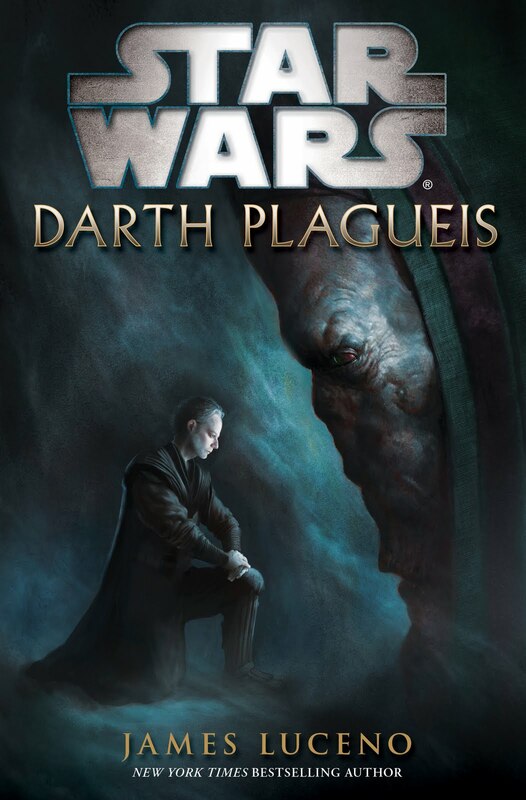 But then about a year and a half ago it was announced that Darth Plagueis WOULD be published after all. So here we are in January 2012. Getting my copy of Darth Plagueis was the first thing that I did when I had time on Tuesday morning. I took my own sweet time reading this book and finished it yesterday afternoon. So was it worth waiting seven years for? Do we finally get definitive answers about the shadowy history of the future Emperor Palpatine and his own Sith Master? Heck, I was authentically shocked at how much previously-hidden lore gets exposed in Star Wars: Darth Plagueis. This might be the most revelation-packed Star Wars novel in the history of anything. 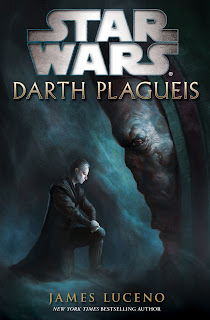 Luceno went for broke with this and apparently he had loads of input from George Lucas himself about Plagueis and Palpatine, and in my mind there is no question that this might be the most canonical piece of Star Wars literature in many a great moon. And in the hands of accomplished saga storyteller James Luceno - who previously delved into the history of that galaxy far, far away with Millennium Falcon and Dark Lord: The Rise of Darth Vader - Darth Plagueis is a masterful work of personal drama, political intrigue and philosophical treatise... all at once! Darth Plagueis begins 67 years before the events of Star Wars Episode IV: A New Hope and the entire book is essentially a "trilogy", with each third covering a two-year span of time. It's a lot of chronological ground to cover in what amounts to 368 pages of narrative, but Luceno's tactic is extremely effective. When the story begins we find that Plagueis, a Muun, has been apprenticed for many decades to Darth Tenebrous: a Bith Sith (who'da thought a race of jazz artists could produce such a dastardly Dark Lord?). Being of the line of Darth Bane, Plagueis soon dispatches Tenebrous in true Sith fashion. He then makes his way back home to Muunlinst where he enjoys public power and authority as Hego Damask, Magister of the InterGalactic Banking Clan. Among other things, Damask runs his own Bohemian Grove-style yearly retreat for the galaxy's top businessbeings and politicians, complete with drunken debauchery and ultra-violent mayhem. But his real passion is for his secret lab: a place where Plagueis is doing all sorts of nasty experiments on living organisms and the midi-chlorians residing within their cells. You see, Plagueis is hellbent on stopping the Rule of Two for all time... by finding a way to be the very last Sith Master: one who will never die. His quest to accrue and consolidate his power behind the scenes soon brings him to Naboo, where Plagueis intercedes in a planetary political crisis. It is on Naboo that Plageuis comes to notice the son of a nobleman: a young man seething with ambition... and possibly something more. Yes ladies and gentlemen, it is Palpatine. And we learn more about the future Emperor in Darth Plagueis than we have ever learned before. We come to find out about Palpatine's family, his formal education and the beginnings of his political career. We discover how Palpatine came to be a Sith Lord under Darth Plagueis (just as Plagueis also reflects upon how he became a Sith under Tenebrous). We are shown Palpatine taking his first Force-ful steps down the path of the dark side, and we are there as he is given a new name by his tutor: "Sidious". Palpatine's rise to power and secret Sith education comprise much of the second part of Darth Plageuis, as Plagueis continues his dark experiments in midi-chlorian alchemy. One notable event which happens during this period is when Palpatine is given a Zabrak infant: the future Darth Maul (bigtime props to Luceno for tying The Clone Wars series on Cartoon Network in and how it gets reconciled with previous Maul-y material!). And gradually we begin to see other pieces of the larger game come onto the board: Jedi Master Dooku's growing dissatisfaction with the Jedi and the Republic they are sworn to serve, the cloners of Kamino, the corruption in the Senate, and the rise to prominence of gangsters like Jabba the Hutt and factions such as the Trade Federation. This is a dense book. I think even the font size might be smaller than normal for a Star Wars novel. And Luceno has packed it with lore gathered from the length and breadth of the Star Wars mythos. Expect lots of pleasurable nuggets to be found if you're a serious Star Wars enthusiast, but even if you aren't this is a rollickin' dark, violent, fun and at times even a funny read. In short: everything that a Star Wars story should be... and with Darth Plagueis, James Luceno has not only raised the bar but also put it on top of the whole heapin' mountain. Star Wars: Darth Plagueis gets my absolutely highest recommendation. It may not have turned into what James Luceno had originally envisioned, but in my opinion what it has become at last is something far more accessible and enjoyable. And if the Flanneled One is wise, he will now let Luceno be turned loose on that tale about Qui-Gon Jinn and the Whills that we know is also out there somewhere. In the meantime, go get Star Wars: Darth Plagueis. Do it now. Or, perish in flame. It's your choice, but not really. Darth Plaguis is in my top 3 SW books ever. Heir To The Empire and Outbound Flight are the other 2. Great review!! Chris I know you've been through family loss recently so hope you won't mind me saying, that I wondered what you thought of this book in that light. But I understand what you're asking. I think that the Sith's obsession with physical immortality is something that hasn't quite been adequately addressed yet, even though I do sense that Luceno was touching upon that in this book. Another reason why I'm hoping he'll eventually write a book about Qui-Gon and the Whills and how they taught him the trick for keeping one's identity after death. Once upon a time, I would have thought that physical immortality was something to desperately be desired and sought. But now, not at all. The biggest problem with physical immortality for me is that it curses an individual to live forever in a fallen state, with no chance to move on and reunite and reconcile with those who have gone before.